These days lots of people have high-speed Internet. And, they hear the blazing fast speeds they are being offered by different Internet Service Providers (ISPs). But, is it really as fast as they claim? So, you may want to verify the claims of the providers and make sure you are getting what you are paying for? 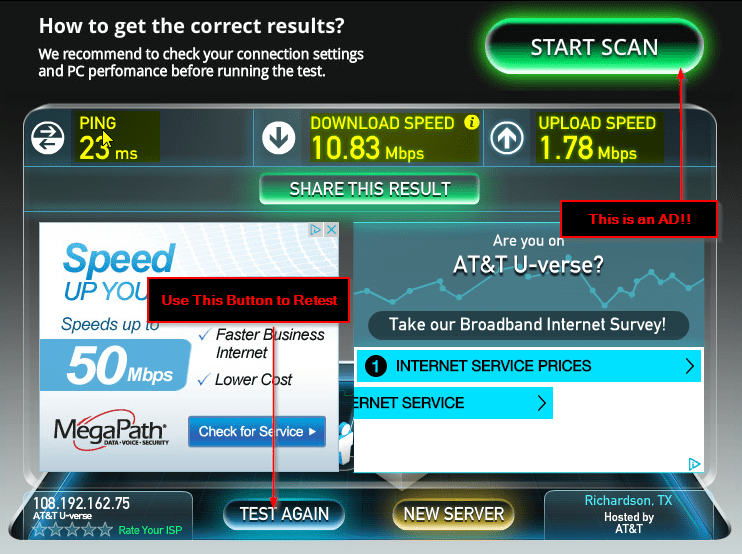 If so, you need to check out speedtest.net to verify the speeds. When you first get to the site, you are going to be greeted by a great deal of ads. This is one instance where I don’t mind the ads because the utility of it is pretty good as long as you are not tricked into clicking on the ads. There is one major deceptive button towards the top that says “Start Scan”. This is just an ad trying to get you to download software to optimize your machine. That is not the button we are interested in. 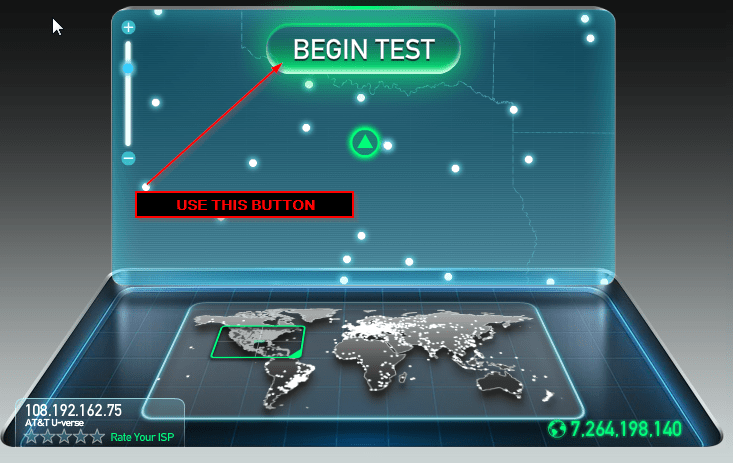 You want to click on the button a little lower that says “Begin Test”. After you click on the button, it will do several things in the background. It will download files from a server in your geographical area and upload a file. This gives you a more systematic approach to testing the speeds. You need to be testing on servers in your geographical area because that gives you a truer sense of speed to the Internet. It also reduces the amount of hops being used in the test which can give an inaccurate result. Furthermore, if you use another server of your own, it could also prove to be a bottleneck and not give you an accurate reading. These servers have a large amount of bandwidth available, and they are spread out all across the Internet. The site will do a good job of finding a server close to you to perform a test. This will make sure that you are testing the last mile of the connection to your ISP and will give a more accurate reading. Once the scan is complete, you will be presented with a lot of useful information. The numbers highlighted above are the ones you are most interested in. The download speed, upload speed and ping (or latency). To get a good sample of data you will want to run the test a few times. This will rule out any anamolies. If you are getting the same results after a few tests then you have a good baseline to present to your ISP if it seems slow. There are other tools out there that do the same type fo test. 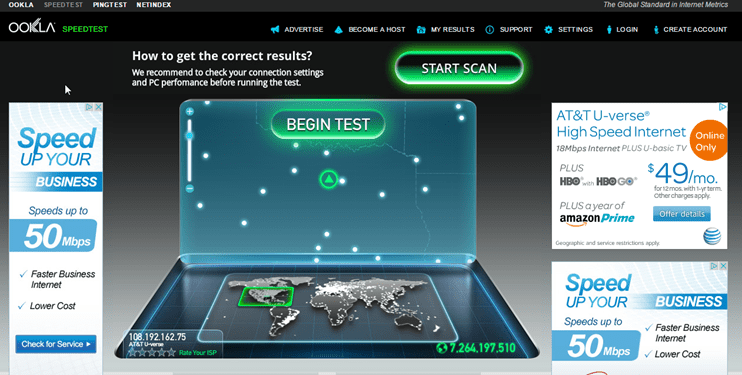 But, I am partial to the results SpeedTest.com shows. It is a useful tool for checking speeds when you suspect there may be something going on with the Internet connection.